1. Transparent, light, ruby-colored red wines are often fresher-styled varieties that were fermented in stainless steel as opposed to oak. Or perhaps the grapes were picked a little earlier or not macerated as long. It might also mean the grapes came from a cooler climate. The opposite is true for darker red wines. 2. Rosé-colored wines are typically made from red grape varieties with a shorter skin contact or maceration than regular red wines. 3. Light white wines hint at freshness. They’re often fermented in stainless steel with direct press in a cooler climate. 4. When they’re young, darker white wines point to the use of oak to ferment the grapes in a warmer climate, or maybe they’re made from a grape variety that tends to give them a deeper color (think gewürztraminer). 5. Then there’s orange wine. This is a white wine that is made like a red wine, where juice and grape skins are in contact. Hillsey assures us the name comes from its orange tint — no oranges were used in its production. 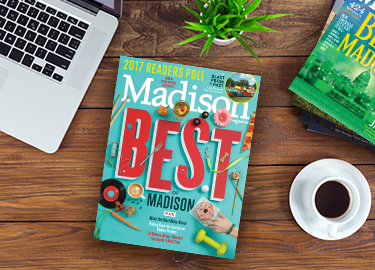 This article is part of the May 2019 cover story, "50 Things That Give Madison Color." Click here for the full story.